When you open the File menu in Windows Explorer, the first command is New. Selecting this command displays a submenu. By default, it contains two commands, Folder and Shortcut, that allow users to create subfolders and shortcuts. This submenu can be extended to include file creation commands for any file class. Tweak UI allows you add or remove unwanted Shellnew entries. Close Registry Editor and restart Windows. The "HTML Document" will appear in the sub-menu. When you choose "HTML Document", a 0 byte file named "New HTML Document" appears in that folder. The file is 0-byte because you've created the REG_SZ named NullFile. NullFile Creates an empty file. NullFile is not assigned a value. If all of the above are used for a certain file type, the one with the top Priority is used, rest all is ignored. 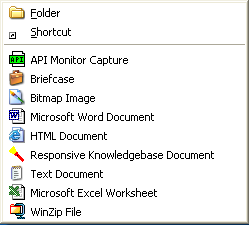 Browse to the above folder and you'll see that Office applications (Word, Powerpoint, Excel) have created the template files there already.